Robert Moore recently contacted me to share the story of his Golden Judson. Jud visited nursing homes, raised Grandchildren and generally brought joy to everyone. "Nursing Home Charisma" is an accounting of his visitation work. Time had come for Jud, our nine-year old Golden Retriever son, to get a job! Grandkids were growing up, releasing him from most of his ball playing responsibilities. He still had to walk us, but only an hour or so daily. Jud needed a job! Pets On Wheels, a pet-visitation therapy program serving health care centers where volunteers and their dogs visit the elderly and infirm, sounded like Jud’s dream job! The work suited Jud’s personality, and qualifying to visit nursing homes through the County Health Department was a snap. For Jud. Now it was up to Lucy and me to prove we were competent to tag along. Jud’s presence would‘ve identified us that first Saturday as Pets On Wheels people, but he wasn’t with us when the elevator door opened to usher Lucy and me abruptly into a world hitherto unknown to us. This was our orientation. We’d been instructed to make certain Jud did not eat anything spilled, warned not to become too attached to individual residents as such would inevitably lead to broken hearts and advised that most residents would remember Jud, but not us. Our role that day was to observe how Elizabeth approached residents with her Sheltie, and then decide whether we could do this. Everyone was confident of Jud’s ability; Lucy and I were on trial. The following Saturday when the elevator door opened Jud was with us, and a totally different experience awaited. We’d planned to quickly see some of the same folks and leave, only . . . well, this is Jud’s story. Spotting the usual solemn group arrayed around the nurse’s station, Jud confidently waded in. Only after a severe woman who long ago had forgotten how to smile buried her face in his neck and began cooing and Jane wheeled her chair close to tell him what a pretty boy he was, did we comprehend that Jud had instantly, and effortlessly, changed that world! Nursing homes are hot, and after two hours the nurses were following us around with cups of fresh water. For Jud. This was not the same place we’d visited a week earlier! Today we were seeing residents, not as a group on the down side of life, but as vibrant individuals with their own life stories. Sammy was the UPI photographer who took the famous JFK pictures; Rachel had been General Eisenhower’s personal secretary; George, commanding attention as he paced the halls, designed the set for the Oklahoma Broadway production; and Philomena, whom Jud did teach to smile again, had raised Poodles on a farm in Kentucky. And ninety-eight year old Ellen, a school teacher, geologist and artist whose ageless beauty remained undiminished long after she’d outlived family and friends, insisted she would paint a portrait of the three of us. Dr. Roberts, who had chaired the Romance Languages Department at New York University, quoted poetry in French and Spanish to Jud, stretched out at his feet. We even conducted a clinic brushing Jud’s teeth to the delight of first-floor residents who’d “never heard of such a thing!” Lucy’s professor never did remember her, but he sometimes remembered Jud, and enjoyed telling, over and over, of adventures he’d encountered many years before . . . at least until we were banished from the Alzheimer’s ward by a head nurse deathly allergic to dog hair. Yikes!! 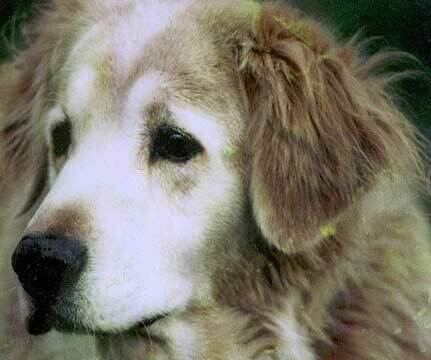 Jud was a Golden Retriever! Judson passed away March 18, 2003, one month and ten days shy of his 15th birthday, with his Golden brother, Grady, laying at his side. This tells a small bit of Robert's feelings for his Jud.